THE High Court in Harare yesterday ruled that National Security Minister Owen Ncube had no authority to order a shutdown of Internet services. Service providers immediately restored services. Internet was shut down last week when the authorities felt it was being abused to stoke violent protests in Harare and other cities. High Court Judge Justice Owen Tagu held that Statutory Instrument 212 /18 as read with Section 104 of the Constitution of Zimbabwe reserved the administration of the Interceptions of Telecommunications Act for the President. To that end, the President was the only authority empowered by law to direct Internet shutdown whenever it is necessary, he said. "From the preliminary arguments, it is clear that the minister had no authority to issue such a directive as he is not the one in charge of the administration of the Act. I will only grant the first relief that the directive is hereby set aside," said Justice Tagu. The judge made the ruling in a case in which Zimbabwe Lawyers for Human Right (ZLHR) and the Media Institute for Southern Africa contested the constitutionality of the directive. The minister, in his opposing affidavit, stated that he was the one who issued the directives. 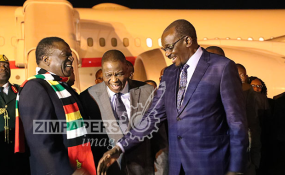 Lawyers representing the Government had sought postponement of the case to take instructions from President Mnangagwa on his return from Eurasia. The lawyers wanted to find out if the President had not delegated his powers to Minister Ncube. But the judge issued an interim relief in favour of the two applicants. Justice Tagu, however, did not rule on the constitutionality of the law in directing Postal and Telecommunications Regulatory Authority of Zimbabwe (PORTAZ) to shut down the internet. The minister between January 15 and 18 issued directives for a shutdown of Internet services at the height of the violent protests last week. President Mnangagwa, Minister of State in the President's Office for National Security Owen Ncube, Director-General of Intelligence Services, POTRAZ, Econet Wireless Zimbabwe, NetOne Cellular Private Limited and Telecel Zimbabwe, were listed as respondents in the application.